The north side of our front yard is a certified National Wildlife Federation Backyard Habitat. Really! We have a certificate! You can do the same by providing food, water, cover and places for wildlife to raise their young. It is so much fun to see all of the critters that stop by for a visit. I have a series of posts to show you our Garden﻿ Guests. 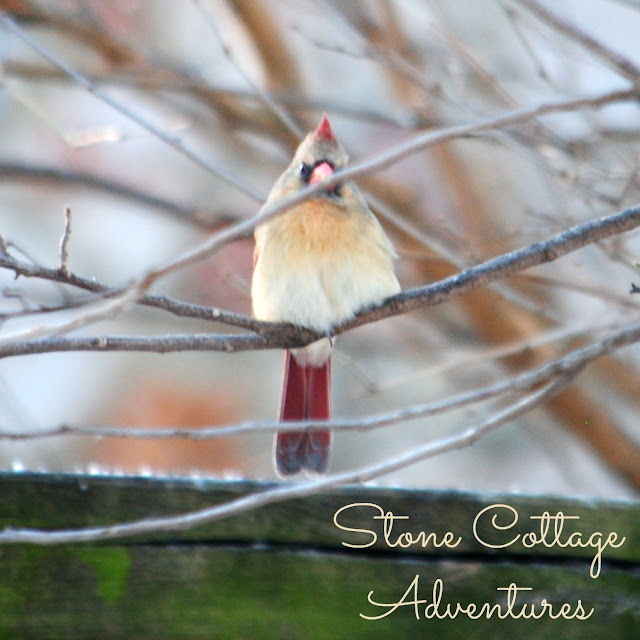 This female cardinal seems to be peeking under the branch! Isn't she pretty? These photos were taken on a cold morning with a dusting of snow on the ground. On shots like these, I always wonder if they are watching me. What's happening in your back yard? A sweet little fellow but looks a bit cranky. Absolutely amazing pictures! I love your bird posts! 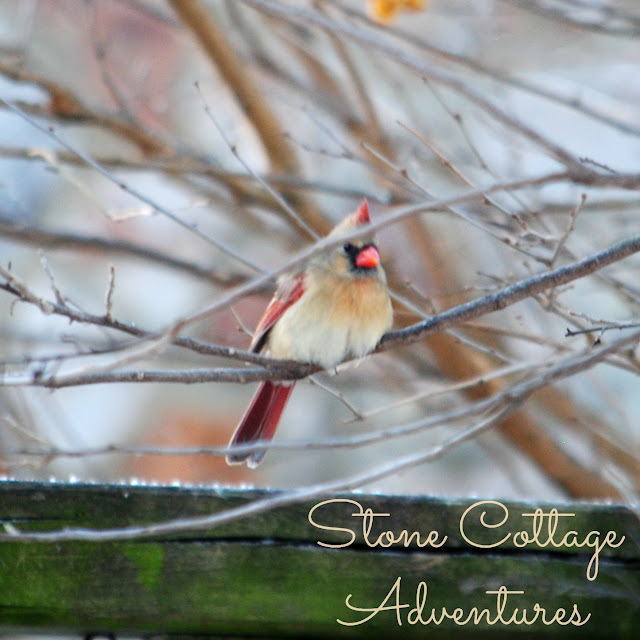 My husband loves looking at birds----this one is so pretty! She is lovely, we have a pair of cardinals that live here too. It is always wonderful to see all the birds that visit our feeder. You took wonderful pictures. Gorgeous. The cardinal is my all time favorite bird! And the female is just as stunning as the male in my opinion with her silver gown studded in ruby red!! 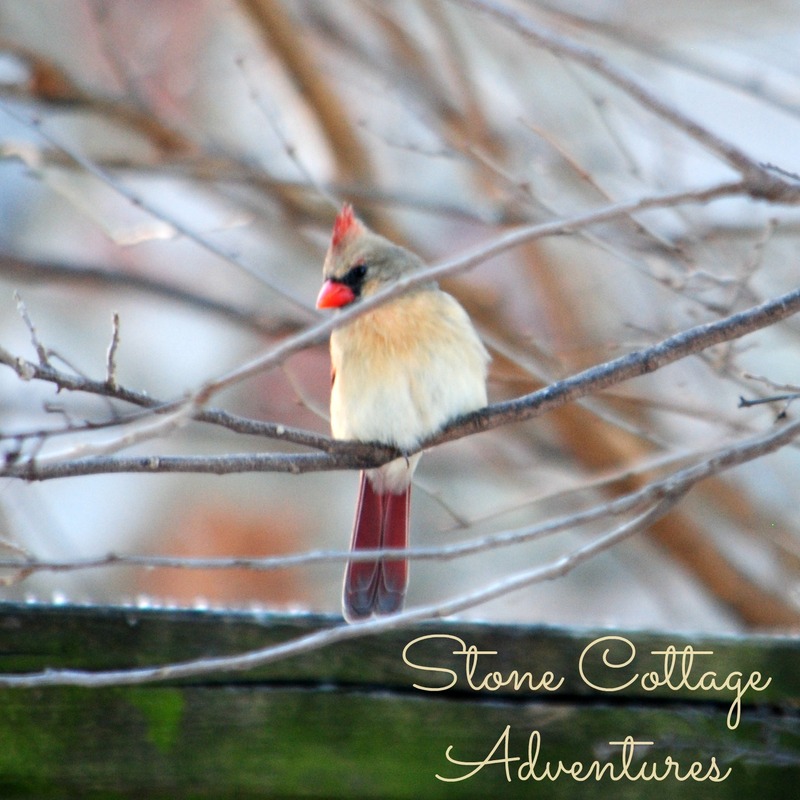 I love cardinals and your photos of her are fabulous! One of my favorite birds and I'm always happy when they come to feed. Thank you for sharing with us this week at Celebrate Your Story, have a great weekend. Your photos are lovely. Thank you for sharing at the Snickerdoodle Create~Bake~Make link party! I am featuring you today at Snickerdoodle. What a natural pleasure! This is one of my favorite sights! Thanks for sharing your lovely photo of your beautiful Garden Guest: Female Cardinal with us on the Healthy Happy Green and Natural Party Blog Hop. I'm pinning and sharing. I love your pictures. We have 2 birds feeders at our house and I love watching the birds. 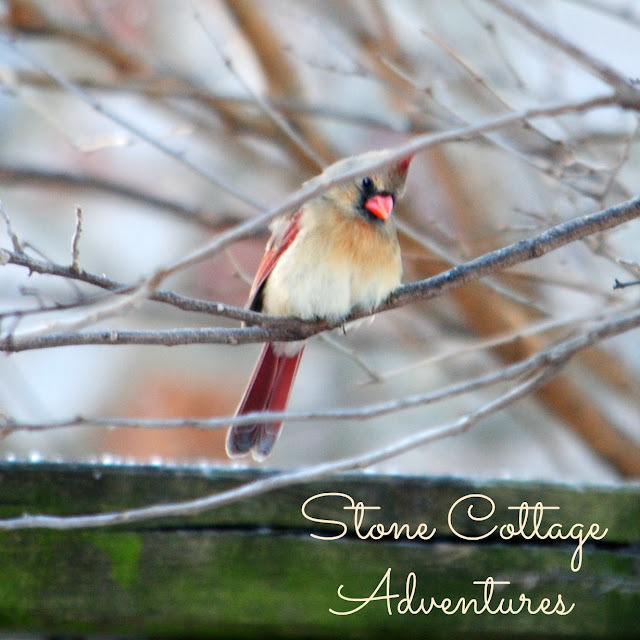 We have a pair of cardinals that comes to the one bird feeder and we seem to see the female cardinal a lot more than the male. Sharing. Wonderful coloring and great photos. Birds often remind me to be calm and still.Saw you at the HHGN blog party. Congratulations for being featured.